Synthetic peptide corresponding to Human MAG/GMA aa 50-150. 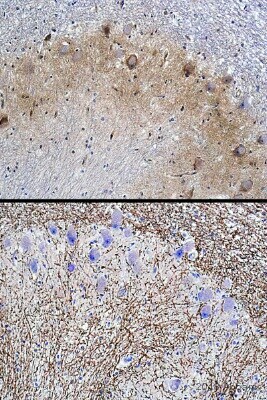 Rat brain lysate PC-12 cells. Our Abpromise guarantee covers the use of ab46803 in the following tested applications. WB 1/5000. Detects a band of approximately 100 kDa (predicted molecular weight: 69 kDa). Publishing research using ab46803? Please let us know so that we can cite the reference in this datasheet. 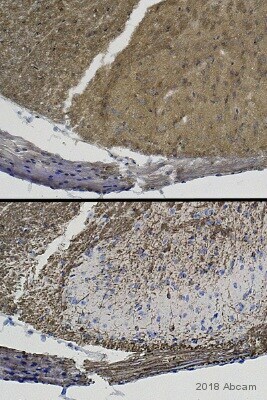 I am very pleased to hear you would like to accept our offer and test ab46803 in IHC-PFA fixed mouse brain. This code will give you: 1 free PRIMARY ANTIBODY/PROTEIN OR VALUE OFF OF ORDER before the expiration date. To redeem this offer, please submit an Abreview for IHC-PFA fixed mouse brain and include this code in the “Additional Comments” section so we know the Abreview is for this promotion. Please remember that submission of the Abreview is sufficient for the discount code to become active. I can certainly offer you a testing discount but we would need to clarify a few things regarding the experiments. 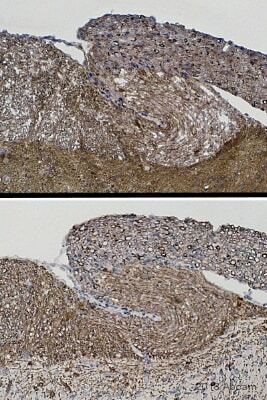 Could you please confirm if the application will be ICC/IF (Immunocytochemistry) or IHC-P or IHC-Fr (Immunohistochemistry)? Would you use cultured cells or tissue section? What fixative will be applied (ethanol, methanol, acetone, formalin etc)? I would advise you to visit the following site where the Terms and Conditions of our testing initiative can be found at: www.abcam.com/collaborationdiscount.